Are you a PT or business owner who would like a tailored in-service for your staff on the Pilates Apparatus? If you answered, “yes” to any of these questions, reach out to Kim at kim@movecolab.com for a consultation. With Kim’s creative background and experience in curriculum writing, she aims to take your existing materials and transform them into cutting edge teaching and learning tools that are easy to use. Features of Kim’s curricular materials are their transparency of goals, specific learning outcomes, assessment strategies and unique assignments. All of which will echo your company’s mission and facilitate a reflective, contemplative nature in students’ learning. Kim strives to create objective rubrics and dynamic teaching materials for educators in an effort to offer consistency from assessment of one student to another, ease the overall assessment process of students’ work and increase the level of one-on-one engagement between the educator and student. Kim designed and successfully adapted the Polestar Pilates Professional Series to meet university standards for curriculum approval as a credit-bearing course of study. The launch of this program at Rutgers University in 2013 marked the first 450-hour Pilates Teacher Training Program to be offered at the university level in the USA. 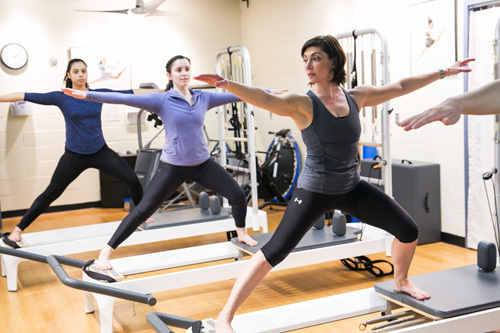 The Polestar Pilates Teacher Training Program at Rutgers University is the first and only teacher training program to use the Pilates Method Alliance Board Examination as its exit exam.